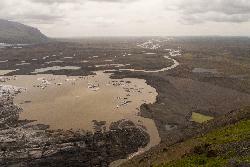 View of Skaftafellsjökull drainage basin from the Sjónarnípa viewpoint on walking trail at Skaftafell National Park. Drainage ends at Atlantic Ocean. 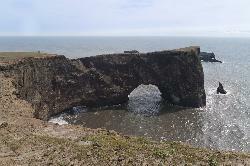 from site: Dyrholaey actually means “Door Hole” in Icelandic, and this area is called such because of a rock formation in the ocean with a giant arch in the midst of it. The arch is so big, that during calm weather, ships can sail through it. 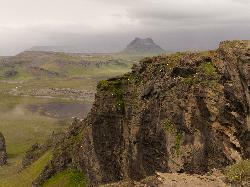 from site: The small peninsula, or promontory, Dyrhólaey (120m) (formerly known as Cape Portland by English seamen) is located on the south coast of Iceland, not far from Vík í Mýrdal. 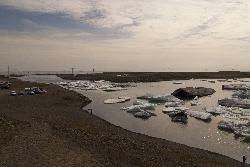 It was formerly an island of volcanic origin, which is also known by the Icelandic word eyja meaning island. 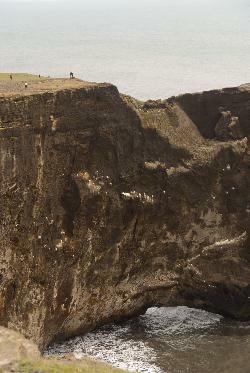 from site: Dyrhólaey is a promontory reaching out into the ocean on the south coast of Iceland. It is the southernmost part of the country, about 120 m high. Off Dyrhólaey there are rock pillars, that are unique natural formations. from site: The very first lighthouse was built on Dyrhólaey in 1910. The present lighthouse was built in 1927, and the building materials were transported by boat to the port Dyrhólahöfn and pulled up onto the promontory along a cable from the shore. from site: This is the southernmost coastal hamlet of the country and the only one without a harbour. The flat, black beach south of the village was declared one of the 10 most beautiful island beaches of the world by the Iceland Magazine.